What is a Rhesus (Rh) Factor test? Rhesus (Rh) factor is an inherited protein found on the surface of red blood cells. If your blood has the protein, you’re Rh positive. If your blood lacks the protein, you’re Rh negative. 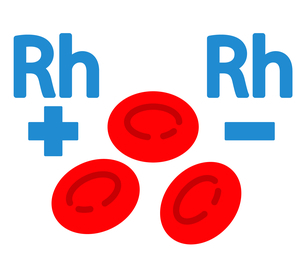 Rh positive is the most common blood type. Having an Rh negative blood type is not an illness and usually does not affect your health. However, it can affect your pregnancy. Your pregnancy needs special care if you’re Rh negative and your baby’s father is Rh positive. Who should get a Rhesus (Rh) Factor Test? This test may be ordered by your doctor because Rh factor can cause problems if you are Rh negative and your fetus is Rh positive. This is called Rh incompatibility. These problems usually do not occur in a first pregnancy, but they can occur in a later pregnancy.